Cannot positively identify at this stage but possibly a Footscray team circa 1930’s, if the guernsey is anything to go by. A quick scan through the published history of Footscray Football Club (see note below) indicates this is not a Footscray Senior Team. Circumstantial evidence that this group is indeed a Footscray side is that the photo has been taken in the exact same location (at South Melbourne, against the background of the grandstand wall) as seen in the image of the (circa 1936) South Melbourne Seconds team (Photo 58, H2008.122/42). This coincidence suggests that Photo 37 is possibly a shot of a Footscray Seconds team taken in the same session as the shot of the South Melbourne Seconds team. (Note South have black shorts; the ‘Footscray’ team have white). Significantly perhaps, Footscray won the VFL Seconds premiership in 1936. So Photo 37 may be a photo of the 1936 Bulldogs’ Reserves premiership side. On the other hand, the socks and jumpers in Photo 37 are not uniform. Note the polyglot nature of the players’ socks in the front row. Similar jumpers to Footscray but also a lack of uniformity in jumper style. Some have hoops up near neck while others have hoops low. Two players are wearing black shorts. The presence of a gent wearing an unusual hat and carrying a cane lends some intrigue to this photo. His central position in the photo may suggest a Services team or Footscray district team. Adding to the intrigue is the presence of two players who very much resemble top footballers from VFL clubs other than Footscray. The player fourth from left in the middle row resembles Colin Williamson (Northcote, St.Kilda, Brighton, not Footscray) and the player on the extreme right of top row resembles Neville Huggins (Fitzroy, North Melbourne, Williamstown, not Footscray). If not Footscray, then possibly Services or workplace team - circa late thirties/early forties. This team is probably a Police League team. The Gent in the middle appears to be wearing a police Badge from circa early 1930s. Below is a comparison of a 1901-1936 badge from http://www.ozbadge.com/victoria.html. The identification of Neville Huggins and Colin Williamson and a subsequent search of Police teams lead to a match with the North West suburbs Police Team. The names of other players on the team appear to confirm this match. With a nickname of 'Copper', we can easily identify his occupation. Evans was inducted into the Victoria Police Sporting Hall Of Fame in 2011. Evans played for Geelong 1929-38. See http://en.wikipedia.org/wiki/Jack_Evans_%28footballer%29 Compare his photo to his 1933 Wills card and another Geelong photo. 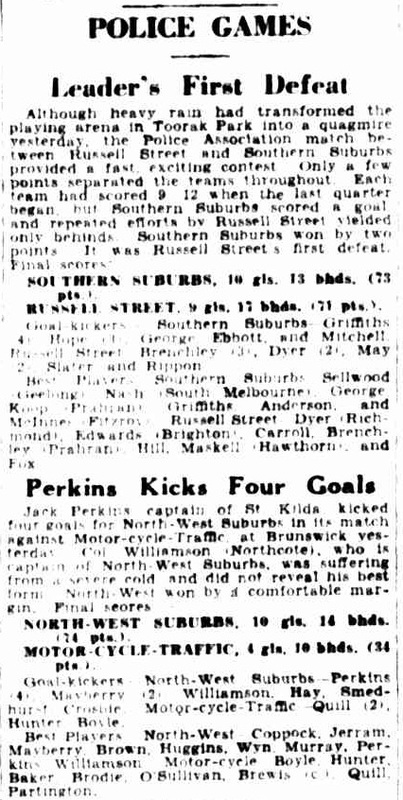 Huggins played for Fitzroy in 1929, North Melbourne 31-36 and then Williamstown, winning the Recorder cup in 1937. He was also a Policeman by occupation - see http://en.wikipedia.org/wiki/Neville_Huggins. Compare the photo here to his 1933 Wills Football card and a photo from him in a North Melbourne team. A Williamstown player was also a policeman. A 1931 Williamstown Chronicle article mentions his injury in a Police match.